The Russian Orthodox Church Outside Russia (ROCOR) has called for Vladimir Lenin’s body to be removed from Red Square as a demonstration of the Russian people’s reconciliation with God. The address was read in all of ROCOR’s parishes during Sunday services, when priests once again called upon their congregations to contemplate history in order to understand why Russia has faced all of its recent ordeals. At the same time, the address recognized that Western antagonism has been one of the reasons for Russia’s hardships. “Today’s relentless baiting of Russia on the part of Western civilization existed a century ago, and a long time before that – the world hated the Russian Empire as an heir to Holy Orthodox Rus. Nothing could help this – neither loyalty as an ally nor the constant readiness of Russian sovereigns for cooperation,” it read. The Russian Orthodox Church Outside Russia is a semi-autonomous part of the Russian Orthodox Church, which was founded after the 1917 Revolution by priests and parishes that had fled the Communist regime and its repressions against religion. In 2007, ROCOR and the Russian Orthodox Church signed a treaty on reunification, restoring the canonical link and marking the event by a joint service celebrated at Christ the Savior Cathedral in Moscow by Patriarch Alexy II of All Russia and Metropolitan Laurus of the Russian Orthodox Church Outside Russia. The issue of removing Vladimir Lenin’s body from Red Square in the very heart of Moscow has been discussed from the early days of Perestroika, but so far the only change has been the removal of the honorary guard from the Mausoleum. The debate usually intensifies before his birthday and the anniversary of the October Revolution. On Monday, MP Ivan Sukharev (Liberal-Democratic Party) addressed Upper House chair Valentina Matviyenko to request that Vladimir Lenin’s Mausoleum be removed from Red Square. The lawmaker told RT that it’s necessary to put an end to this business once and for all, reconciling the Reds and Whites, having given the Bolshevik leaders an Orthodox burial. 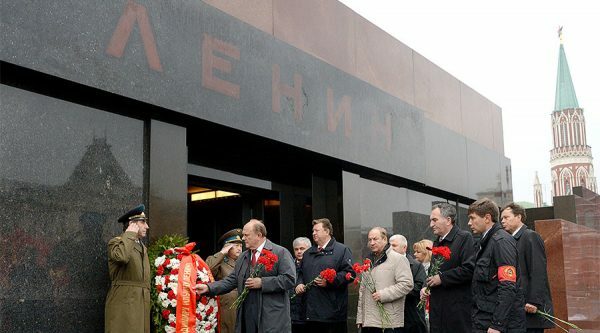 A poll conducted by the government-owned VTSIOM polling agency in April of 2016 showed that 60 percent of Russians support the general idea of burying Lenin. Among those, 36 percent say it can’t happen soon enough, while 24 percent believe it’s better to wait until the generation that still reveres him passes away. Meanwhile, 32 percent say that Lenin should stay put – in the Mausoleum next to the Kremlin.